Between your checking, savings, money market, and investment needs, the paperwork can be overwhelming. If you've ever wished you could combine them all into one hybrid account at a single institution then you're in luck. Thanks to the invention of asset management accounts, it's not only possible to combine all your financial paperwork and activity, but you can easily get it done in a single afternoon. Following the stock market crash of 1929, Congress passed the Glass-Steagall Act. The legislation banned the consolidation of banking and securities firms in order to better protect the public in the event of another major catastrophic financial event. The result was that investors had to maintain separate accounts at different institutions. In 1999, then-President Bill Clinton signed the Gramm-Leach-Bliley Act into law. It effectively overrode the Glass-Steagall Act and permitted the creation of financial services firms that offered banking, brokerage, and insurance services to customers. Shortly thereafter, these financial services companies began offering asset management accounts as a solution to their customers' needs. An investor deposits money into his or her asset management account. 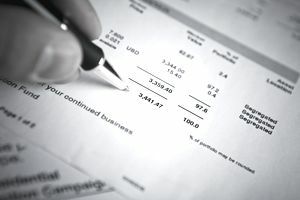 The balance is swept into a money market fund (which earns a higher rate of interest than a regular checking account would) until the account holder writes a check, uses the debit card to make a purchase or withdrawal cash at an ATM, or purchases stocks, bonds, mutual funds or other financial instruments. At the end of each month, the account holder receives a consolidated statement detailing the checks posted, deposits made, investments owned, transaction history, dividends and interest received, and more. Some asset management accounts offer periodic investment programs which allow for automatic purchases of mutual funds on a regular basis to take advantage of the power of dollar cost averaging, dividend reinvestment plans. If you decide to go with this kind of asset management account you'll also be able to take advantage of systematic withdrawal plans (which can be perfect for those in retirement or those who need to receive a portion of their money on a regular basis) and direct deposit service. Because the minimum balance is often respectable (the low end tends to be around $15,000), many people automatically qualify for margin privileges. A consolidated monthly statement that makes keeping track of your financial activity much easier. Unlimited check writing with money market sweep, which helps generate more interest income. Depending on the firm you choose, you can consolidate your asset management accounts with both discount and traditional brokerage models. The research being done by a lot of banks that offer asset management accounts has not yet caught up to the research offered by brokerage firms. However, this will most likely change with time, so it's worth keeping an eye on it. Small investors that cannot meet the minimum opening balance of $15,000 are not eligible. Many financial services charge small monthly or quarterly maintenance fees unless the asset balance exceeds $100,000.